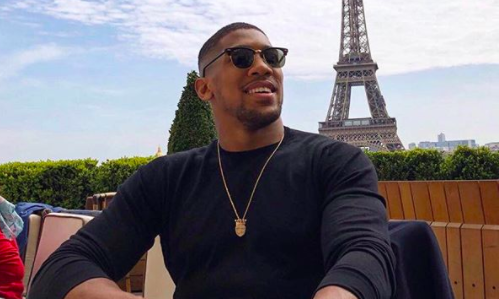 Anthony Joshua celebrated adding another belt to his kitty by jetting off to Paris for the weekend. The WBA, IBF and IBO heavyweight champion was taken to the distance for the first time in his career before winning the WBO belt with a unanimous decision win over New Zealand’s Joshua Parker last week. And Joshua made sure he gifted himself a short getaway in the French city as he took to his official Instagram account to share a picture of himself from a restaurant. “Euro Star,” he captioned the snap, in which he can be seen sporting a black outfit and a golden necklace, with the Eiffel Tower in the backdrop. What did you order off the menu, AJ? Meanwhile, Joshua is expected to fight WBC holder Deontay Wilder later this year. If the fight doesn’t materialize, he might square-off against mandatory challenger Alexander Povetkin.